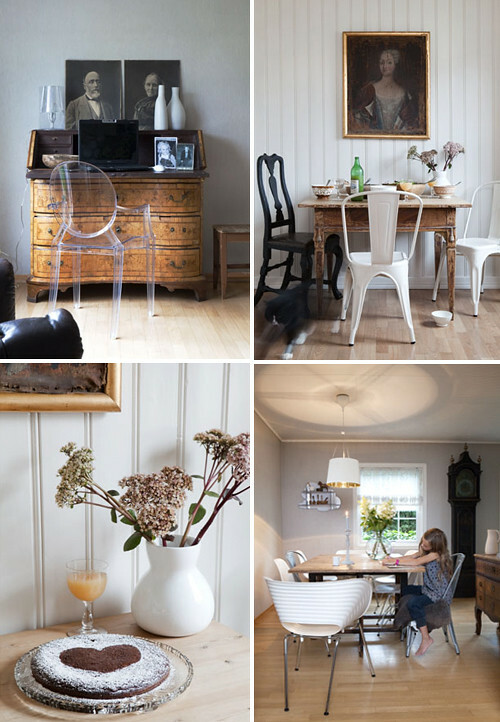 A unique mix of antique and modern furniture can be found in this gorgeous Scandinavian house. Beautiful pictures! Loving the mismatched chairs in 2nd and 4th pictures, such chic! those top two images are awesome! I absolutely love a mix of modern with antiques. Great pics! Thanks for sharing. I love mixing modern and old together. Thank you for all your comments and kind words. I am always very happy to hear that you enjoy reading my posts!! Love antique furniture – the style, the workmanship, the durability. I collect art nouveau / art deco pieces. Seriously, one of my all time favorite trends. I have always admired Trine Thorsen’s work. I hadn’t seen these pics before. Lovely. beautiful antiques , perfect contrast with the interior . very impressive .